What is SUP paddle boarding? SUP stand up paddle surf is a fun water sport that has been around in Barcelona for a few years now and which is growing in popularity every year. Stand up paddle surfing originates from the home of surfing, Hawaii, and is called "Hoe he'e nalu" in Hawaiian. Surfing on long boards is an ancient form of surfing on the Hawaiian islands which re-emerged when surfing instructors wanted a way to manage large groups of students. They used long boards to get a higher viewpoint and better visibility. The modern sport is called stand up paddle surfing (SUP) and is popular because it's fun, safe and easy to learn - and you don't need big waves. The coast line of Barcelona and Catalunya is great for paddleboarding and you can often find good waves in the late afternoon for some exciting paddle surf board rides. The great thing about paddleboarding is that you can also enjoy a ride on a paddle surf board without waves and you get a good work-out at the same time. How to SUP paddle surf? Paddle surfing consists of a big surf board and a paddle. The board has a leash which you attach to your foot so you don't lose the board and then you propel yourself forward using the paddle. The paddle can be adjusted for height. That's it. Who can learn to SUP paddle surf? Anyone can learn to how to SUP paddle surf whether young or old. The great thing about this watersport is that you can enjoy it in many different weather conditions. When the sea is flat and calm, you can quickly master how to stand on a paddle board and propel yourself forward using the paddle. On calm days you you will love the views of the coastline, the beauty of the sea and you can get a good work-out. In calm conditions with little wind it is very safe to paddle quite a long way out from the coast or up and down the coast. At any time you can sit on your board, take a break and have a chat with your friends, or have a dip in the sea. In the early morning and evening there are many "zen" moments. SUP paddle surfing is great for beginners and for kids in calm seas. Children as young as 5 or 6 years old can have great fun sharing a SUP paddle board if they stay near the beach under adult supervision. SUP a are a great all round family sport which everyone can try because it is so easy to kneel and paddle. Many other water sports require hours of courses and a lot of practice, but SUP only needs a short lesson from an instructior and then you are off. If the conditions are windy and choppy, then SUP paddling surfing becomes a little more challenging, but still great fun. Staying on your feet on an SUP board in choppy conditions takes more practice and patience but anyone can learn. Many beginners prefer to kneel for the first few minutes, until they get used to the motion of the SUP board. Practicing in choppy waves is great fun and good practice for the days when there are big waves that you can surf on. 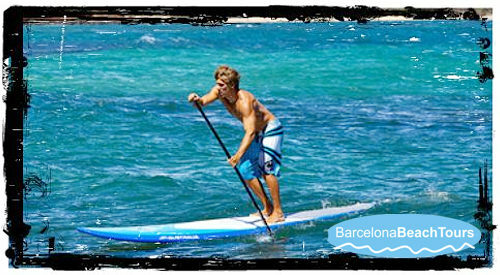 Barcelona has plenty of days when you can ride bigger waves on an SUP board - just like real surfing - only easier. At Gavamar beach just south of Barcelona, there are often days, where you will see waves breaking around 30 meters from the shore. These waves are perfect for beginners because they can be up to 1m high, which is plenty of wave power for an exhilarating ride. Even though the waves are quite small, when you are riding them, it feels like they are huge which adds to the thrill of SUP surfing. Catching the first waves is not easy. As the SUP board quickly accelerates on the wave, many people will lose their balance and fall off the back of the SUP board. But with a little patience and practise you will soon be catching most waves. When you do catch a wave, then hold your paddle out to one side on the surface of the water. That way your paddle becomes an outrigger which keeps you stable on the wave. How long does it take to learn SUP Stand Up Paddle board surfing?